Cast on 20 stitches in colour A. Rows 1 – 4 Knit. Row 5 – 6. Knit 2, Purl 2. Continue this to the last 2 stitches. Knit 2. Row 7 – 8. Knit 2.Then Knit 2 Purl 2 to last 2 stitches. Knit 2. Repeat rows 5 – 8 another 4 times. 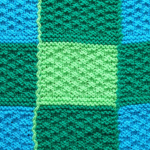 There will now be 10 blocks of double moss stitch. Change to colour B. Repeat the 28 rows as for Colour A. Continue alternating colours until you have completed 7 ‘blocks’ finishing with Colour A. Cast Off. Make a further 3 strips starting and finishing with colour A. Make 3 strips starting and finishing with Colour B. 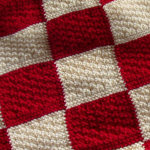 The size of this blanket can be altered by adding to the length of each row and by adding more rows. Sew strips together, alternately, the outside strips will begin and end with Colour A. Alternately – make up your own design using a variety of different colours.